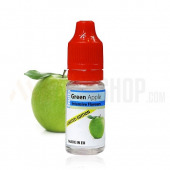 Green Apple 10ml. A crisp, green, juicy & fresh apple with tart and sour taste. The rich and full smell cultivated in moderate temperature where winter is full of rainfall and frost. Green Apple 10ml. A crisp, green, juicy & fresh apple with tart and sour taste. The rich and full smell cultivated in moderate temperature where winter is full of rainfall and frost. Dosage 6-7%. The flavours goes well with clear VPG NicBase and other fruits flavours. Bottle 10ml made from PET material, childproof cap, long, thin dropper. Produced in UE.